Lesley McInally completed her Bachelor of Design Honours Degree in Ceramics and Printmaking at Dundee University, Scotland. For the first 8 years of her career she worked as a full time professional ceramic artist producing both functional and decorative ceramics for galleries throughout the UK. Additionally, she taught ceramics in various educational environments both to adults and children. In 2004 she immigrated to Canada where she continued her studio practice in Cookstown, Ontario. Since arriving in Canada Lesley developed her unique style of stretched slab hand built paperclay sculptures and vessels which contain a rich depth of surface texture. 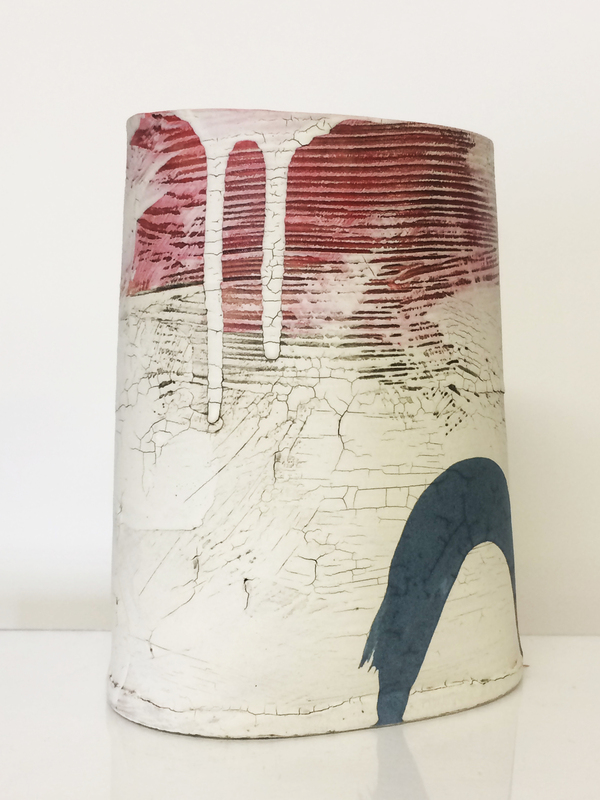 Incorporating her printmaking skills, she has also developed a highly tactile surface using coloured porcelain slips, underglazes and a mono print technique. She continues to be invited to demonstrate her intriguing working methods to numerous guilds, educational establishments and arts associations throughout Ontario. Lesley has been the recipient of numerous prestigious awards and grants and exhibits her work nationally and internationally. Please notify me when new work comes in by Lesley McInally.